Already from 1920 onwards, Oskar Ernst Bernhardt began to hold and commit to paper lectures addressing questions that inwardly occupied people in his environment. 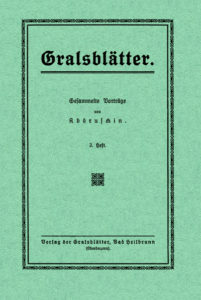 In the years 1923/24, he published lectures and “Questions and Answers”, under the name Abd-ru-shin (“Abdruschin”), in seven individual booklets, the “Gralsblätter” Series 1, issued by the “Publishers of the Grail Folios”, Bad Heilbrunn, the place of residence of the Bernhardt family at that time. As the Author of the lectures of his Grail Message, Oskar Ernst Bernhardt used the name Abd-ru-shin, meaning “Servant (Son) of the Light”. The first spelling of the name was “Abdruschin”, but also the form Abd-ru-shin was already being used in the “Gralsblätter”, even though rarely. From the mid-thirties this was the spelling generally used. Is sexual continence necessary or advisable? “In the Light of Truth – The New Grail Message by Abdruschin”. 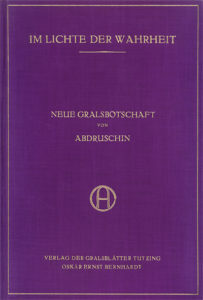 This edition of the Grail Message (with the table of contents appended) was then, and subsequently, known as the “small edition” or “purple (lilac) edition”, or also as the “Tutzing Edition” (the place of residence of the Bernhardt family at that time and the headquarters of the publishing company) of the Grail Message. From booklet 1 of the “Gralsblätter” Series 1, only the lecture “What seek Ye?” was published in the 1926 edition of the Grail Message. The lectures “Live!” (later title in the 1931 edition, and the “final authorised edition”: “Awake!”), “The great secret” (later title: “Silence”) and “Redemption” (later title “Ascent”) were not included in this edition, nor did Abd-ru-shin consider the lecture “Before Abraham was, I am”. “Questions and Answers” from the aforementioned booklets now appeared as lectures; for example, “The Religion of Love” and “The separation between mankind and science”. The lectures “Spirit” and “The development of Creation” concluded the 1926 edition of the Grail Message. They had not previously been released. However, in Booklet 7 of the Grail Folios, the last of Series 1, there was already a pointer to a subsequent lecture on “Creation”. In particular, this reworking of “Questions and Answers” into lectures showed the “interplay” between the author and his readers and listeners. Their understanding (or lack of understanding), their questions and suggestions often “prompted” further lectures. From the beginning it was the spiritual, inner constitution of man that was the key for the form of the Message to be mediated. This process continued until the new compilation of the lectures − during the time of the author’s sojourn in Kipsdorf − in the “final authorised edition”. Thus in compiling the 1926 edition of the Grail Message, Abd-ru-shin in no way felt bound to the previous sequence of his lectures in the Grail Folios, but instead indeed made use of the possibility to compile his lectures as he saw fit and necessary at that point in time.